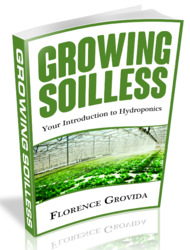 When transplanting into a hydroponic garden, you'll notice some amazing facts. First, the transplanted plants keep right on growing without any shock, wilting or drooping. Second, you can successfully transplant not only small seedlings, but even fully grown plants as long as you do not damage their roots. Figure / 6. Before transplanting a soii-jjmim plam into a hydroponic garden, genrij u<ash iu n*jti wiiili'r cold water to remove an> dirt clinging to them. soil, while its coldness has an anaesthetizing effect on the plant. By the time the transplant "comes to," it is already growing in its new environment and is unlikely to go into shock. You will probably have less success transplanting vegetables from soil than you will the hardier herbs or house plants. Some shock will be apparent when transplanting flowering house plants like African Violets from soil. The plant will probably lose all its flowers, and it might even wilt considerably. Don't despair. There is an excellent chance that the plant will survive, and in five to six days you will see it perk up. Then the plant will likely go through a new flowering cycle and give you some of the best blooms you have ever seen. 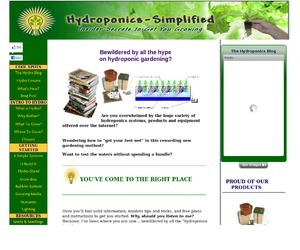 No washing is, of course, necessary with hydroponically raised transplants. For both methods, though, the byword is be gentle with the roots. 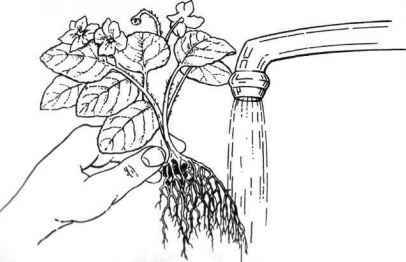 To transplant, simply make a hole in the growing medium down through the drainage medium if you are using one. Drop the roots in and close the growing medium around them. Do not try to untangle the roots from vermiculite or perlite used in a nursery. With soil transplants, try to spread the clean, exposed roots around a little.